As with my Halloween post earlier this year, I came across a single Christmas story that I liked so much that I immediately wanted to do a post about short Christmas and holiday fiction. 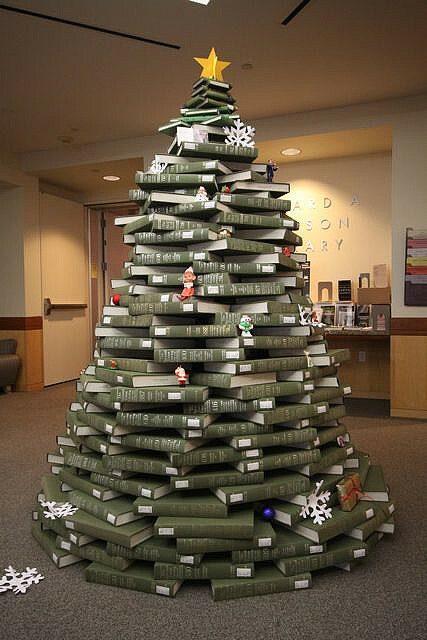 However, I started reading for this much too late, which means there are so many Christmas stories I'd hoped to read but that I didn't get to. The rest will have to wait for next Christmas, I'm afraid, but in the meantime, here are two Christmas stories that I hope folks will enjoy as much as I did. This delightful story is told from the point of view of a Roomba that cleans a church and has come to share the parishioners' faith. What I liked best was the way the narrative carried the Roomba's unique interpretation of the world consistently throughout the entire story. Speaking of points-of-view, I came to this story as an atheist who enjoys reading thoughtful fictional examinations of religion (such as Mary Doria Russell's The Sparrow). As such, I found this very satisfying. Roomba's theology operates on set theory logic, where for Roomba, the Christian faith is the common set that unites it to the humans in the church, and gives it equal standing with them. The "AND" is the distillation of this [and] is a combo of programming logic (where AND, NOT, OR, etc set boundaries and dictate groups and behaviors) and another Bible verse indirectly referenced earlier in the piece (Galations 3:28 - "There is neither Jew nor Gentile, neither slave nor free, nor is there male and female, for you are all one in Christ Jesus). For Roomba the AND would have such obvious and important meaning in its understanding of the Christian faith that it could stand in for anything else it had to say on the matter. At least, that's my take on it. This makes me enjoy the story even more. 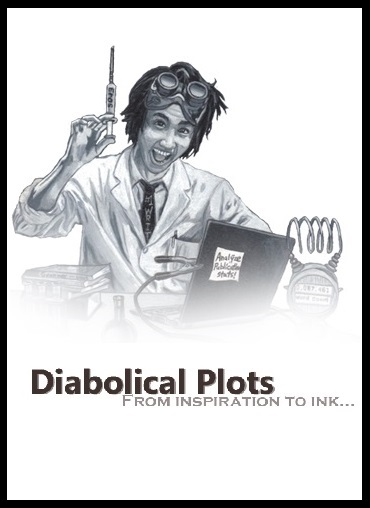 Read here in the December 2015 issue of Diabolical Plots. This dark fantasy flash piece explores what might happen if being Santa Claus is a curse -- or even a sentence -- rather than a blessing. I don't want to say much more because it's a quite short piece, but I thought it nailed the tone perfectly, and had me rooting for the main character. Published in the January 2011 issue of 10 Flash Quarterly here. Tired of The Nutcracker? This little piece of pop-up microfiction says that you might not be the only one. A slightly different version of this story was originally published by Apex in December 2013, as the third place winner in their Christmas horror microfiction contest. Endless Suite by Amy Sisson is licensed under a Creative Commons Attribution-NonCommercial-ShareAlike 4.0 International License. This episode of Top Chef began with the chefs setting out on their California road trip, beginning with Santa Barbara. They made a harbor-side pit stop to pick up some sea urchins, which they took to the Sanford Winery & Vineyards, where Padma and guest judge Dana Cowin were waiting. 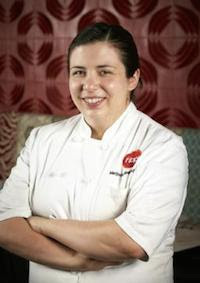 It was interesting to see that Dana knew one of the chefs, Jason Stratton, whom she had named "Best New Chef" for Food and Wine magazine. Now, I'm sure she and all the judges are perfectly capable of being objective so I'm not worried on that count, but it seems strange to me that one of the things the chefs are competing for is a feature in Food and Wine magazine. It draws attention to the fact that we're not always getting brand new, young talent trying to break through in the same way we used to on this show. Instead, we're getting people who are already well-known in the culinary world. It doesn't have to be a bad thing, but in a way I'm still a little sad to see it. After initial greetings, Padma announced that the chefs would start their first Sudden Death Quickfire Challenge immediately, pairing uni (the aforementioned sea urchin) and wine, with 25 minutes to cook. We got lots of commentary from the chefs while they were cooking, and Grayson finally said something that kind of made sense to me, which was that she wasn't sure why people were blending the uni into other ingredients rather than highlighting it, especially since it's delicate. The first dish the judges tasted was Jeremy's opah, which I had to look up to discover it's a kind of fish, with sour apple, cucumber, and radish vinaigrette, paired with a chardonnay. Angelina, who had said she was playing it a little safe since it was a sudden death challenge, made cacio e pepe with uni butter, also with chardonnay. Padma and Dana commented on the saltiness of the dish, but I was surprised that they didn't comment about Angelina using what I assume had to be dried pasta -- she couldn't have made fresh pasta outdoors in a 25-minute challenge so it had to be dried, right? So why go with that when there were clearly a lot of high quality ingredients there to work with? Grayson's dish was crab salad with cucumber, grapefruit, and uni. Dana said it was bold to do so little, but that it was nice. Personally, I don't feel that a crab and uni salad with several ingredients in 25 minutes is "so little," but maybe that's me. Dana did compliment Grayson on her wine pairing, which made Grayson happy because her boyfriend is a sommelier. Jason served a salpicon seafood salad with jumbo crab. I had to look up "salpicon," of course, and found that it is "a mixture of finely chopped ingredients bound in a thick sauce and used as a filling or stuffing." I have to say, the photo of his dish didn't look like that definition to me. Dana said the balance of flavors was lovely, but Padma wished the dish had more uni. Karen had tried to make a soup into which she would "ribbon" the whipped egg and uni, like egg drop soup, but the uni essentially dissolved instead, and Padma said all she could taste was scallion or chive. Giselle made a simple seasoned potato with onion jam and uni; personally I thought this one looked like something I would want to eat, but Dana said there was a bit of a fight between the wine, potato, and onion. Carl made a sea urchin omelet that looked very pretty in presentation, and Dana called it a thoughtful combination. Amar made uni with shitake tempura on lime ricotta cheese and served it with a rose wine, which the judges found to be a nice combination. Francis's curry was complex, and Padma remarked that she could have edited a few ingredients out. Wesley presented creamed corn with uni, fennel, roe, and scallop, which Dana really seemed to like it (although it sounded a little like all that wine tasting was getting to her). Chad served Asian goulash with uni, rice wine, and a little lime. Padma called it intense, and Dana thought the wine went well with it, but the dish itself wasn't balanced. Isaac made an uni potato salad that they liked a lot. In the end, the judges started with their favorite dishes, and Grayson looked pretty surprised to be chosen. Dana commented on the simplicity and the showcasing of the uni. Wesley was another favorite with his creamed corn, and Carl was also complimented for his pairing of eggs and uni (cue Giselle looking miserable because she hadn't been able to find the eggs -- did she ask anybody?). The winner, who got immunity, was Grayson. As much as I didn't care for her in the first two episodes -- and I'm sure she'll annoy me again -- I couldn't help but be happy for her. For the least favorite dishes, Dana named Angelina's pasta with uni butter, Karen's soup due to the lack of uni flavor, and Giselle's potato, which Dana found puzzling and undercooked. Giselle ended up on the bottom, and had to pick one chef to compete against in a head-to-head cook-off. My first thought went to Angelina, who I imagine was a bit shaken by her near miss, and that's who Giselle chose. The challenge was to cook something with ostrich eggs in 25 minutes, which was a little ironic. Giselle decided to make soft scrambled eggs with a little salsa, while Angelina wasn't quite sure at first what she was doing. I was a little annoyed at the chefs yelling out advice to her from the sidelines; it's almost as though they were giddy with being off the hook, but they weren't doing her any favors by yelling at her. She did also end up with a scramble, with charred vegetables and tomato jam. Dana didn't seem blown away by either dish, but named Giselle the winner in the end, even though she wasn't impressed with Giselle's presentation. Overall, this was a good quickfire challenge. I noticed that the majority of the chefs seemed to choose chardonnay, which I imagine is the wine most familiar to a lot of them. I also have to say that I felt sorry for these guys trying to do this delicate plating work outside. Uh oh, it's another team challenge, and the chefs had to pick each other (apart from Grayson, who competed alone as the one with immunity). I'm not saying the show's wrong to do this, but I hate when they have to just look around and pick each other. You know some of them wish the other person hadn't asked them, but they didn't know how to say no. It's just so uncomfortable, like high school all over again. And the chefs didn't appear to choose each that wisely in a lot of cases. Angelina noted her apprehension at getting stuck with Giselle, and I couldn't blame her. Padma then explained that the chefs would have two hours the next day to prep and cook at the Bacara Resort & Spa. Padma dangled an extra incentive; the overall winner would get to come back to the winery and choose an estate wine with his or her own label. And cue badass music as Tom Colicchio walks in the kitchen (which is also rather obnoxious). He arrived to tell the chefs they were now competing against each other: surf versus turf instead of surf and turf. I'm not crazy about mid-plan change-ups like this, especially when they seem designed to ratchet up the tension between the chefs. Karen and Marjorie seemed to handle it pretty well, while Phillip went the passive-aggressive route with Jeremy in their little team interview. Jason ended up at a big disadvantage; he had compromised with Francis and agree to do Thai flavors, and now he was stuck with those ingredients when it's not a cuisine he knows well. Finally, although I applaud chefs helping each other somewhat, I'm not so sure I would have helped Chad butcher his lamb chops if I were Kwame. It's not the same as lending a few eggs, it's lending a skill the other chef doesn't have, and this is a skills competition. That said, I like Kwame a lot so far. The first chefs to serve the judges were Wesley, Amar, and Grayson, the latter of whom got to choose any of the chef pairs to compete directly against. Amar served an olive oil poached halibut with eggless Béarnaise sauce, asparagus, and morels. Tom found it delicate but the fish was a little overcooked, and Cat Cora, who was one of several guest judges, found it too simplistic. Wesley was very apprehensive about his ribeye, which he knew was too tough, and made a bigger point than he might have done pointing out the "artwork," as he called it, which was asparagus purée that he stenciled onto the plate in the shape of leaves. The judges found the meat underseasoned but none immediately commented on the toughness of the meat. Tom was snobby about the stenciling. I mean, I thought it looked pretty, but I do agree that Wesley would have done better not to try so hard to call attention to it. Grayson made a lacquered pork belly with a spiced carrot purée. Cat Cora loved the flavors, as did Richard Blais. Grayson won the round handily -- and after the chefs left table-side, Richard did comment on Wesley's meat being badly cooked. The next pair to serve was Phillip and Jeremy. Jeremy made pan-roasted spot prawns with potato gnocchi and English peas. Cat Cora loved it, and Tom said it was all about finesse. Phillip made center-cut ribeye with rutabaga purée and nori buerre blanc from butter he'd made himself. Cat said it was cooked perfectly. The judges universally preferred Jeremy by a nose, but guest judge Suzanne Goin said she felt bad that they competed directly against each other, because either of them could have wiped out the three previous competitors. I got the feeling that Phillip is not going to take this defeat well, but he needs to remember that just because he will technically be up for elimination doesn't mean there's any chance he would actually be eliminated, based on this dish. Next came Angelina versus Giselle. Angelina served marinated mussels with escabèche sauce (vinegary sauce with herbs and spices), fennel leek puree, and potatoes. Unfortunately, the judges found that she had neglected the mussels in favor of the other ingredients. Giselle served quail with a tamarindo sauce and a cucumber and radish salad. Tom liked the sauce. The editors cut this sequence a little short, jumping right to the win verdict being handed to Giselle without them actually polling the judges on camera as they'd done for the prior teams. Kwame and Chad went next. Kwame made a crab salad with turmeric, asparagus, and radish, that was gorgeous to look at. Tom found it playful and fun, while Suzanne called it decadent (in a good way). Chad made spicy bean, honey and orange-lacquered lamb with asparagus mint purée, which the judges found perfectly cooked and luscious. The judges went four and four, so that Tom had to be the tie-breaker: he gave the win to Kwame. Although I thought Chad was a good sport, I'm glad that Kwame won, because Chad's meat might not have presented so well if Kwame hadn't helped him. Isaac and Carl were up next; Isaac served a fennel-crusted halibut, English peas, and brown butter hollandaise. Tom wanted a little hit of acid, and Dana called something slightly overcooked, although I couldn't catch what she said. Carl did a roasted chicken thigh with prosciutto and English peas. I felt bad for him, because nobody wants to be the one stuck with chicken for a competition at this level, but Tom liked it, especially the white wine dijon sauce. Carl won, although it was another close race. Next came Karen and Marjorie. Karen had difficulty plating, to the extent that she left someone's fish off the plate. I felt terrible for her. Her dish was seared rock cod with carrot orange purée, blood orange vinaigrette, and roasted carrots. The judges loved it, although Padma continued to look put out at her lack of fish. Marjorie served roasted pork loin with olive oil crushed potatoes, glazed vegetables, and citrus gremolata, which is a garnish made with chopped parsley, garlic, and grated lemon zest (yum!). Unfortunately, the pork was very dry -- Dana Cowan actually made a face, and called it 1960s food. Karen dodged a bullet there for sure. Finally, we had Jason and Francis. Jason made a marinated grilled pork loin with steamed crudités, Thai-style egg, and green bean salad. Tom was unimpressed with the flavors, and one of the guest judges told Jason he was sorry Jason had been "bullied" into cooking something he wasn't 100% comfortable with. Well, no. Jason wasn't bullied; he compromised because he thought they'd be cooking together, not against each other. Furthermore, most of the challenges are about cooking things they're not 100% comfortable with. Francis's dish was ginger glazed black cod with jicama cucumber relish and roasted squash. Tom called it a hodgepodge on a plate, and the judges didn't appreciate the skin on the fish. Another close race, and Tom once again was the deciding vote: he chose Jason. The favorite dishes were by Jeremy, Kwame, and Karen (keeping in mind they couldn't pick the really good dishes happened to get edged out in their round, such as Phillip's). The judges were full of compliments for Karen, but Padma pointed out that they couldn't give her the win when the main part of the dish didn't make it to one of the plates. Tom really liked Kwame's dish, and found Jeremy's dish well put-together and thought-out. Guest judge Michael Cimarusti announced Kwame as the winner. The three least favorite dishes were by Francis, Angelina, and Wesley. I felt strongly for Wesley, because he'd just been hired by Richard Blais, and was embarrassed by his performance. To his credit, he made no excuses, but owned his mistakes. Angelina's dish was criticized mainly for the way she treated the mussels, taking them out of the shell so they dried out on the plate. Francis felt like her original dish wasn't enough, which is why she added the butternut squash that Tom thought didn't make sense, but the judges pointed out that she had too many ingredients. Ultimately, Francis was sent home. This is based partly on personal tastes -- I'm not terribly adventurous when it comes to seafood -- but the dish I most wanted to taste was Phillip's ribeye. It looked like it would melt in your mouth. I don't care for his personality a great deal, but there's no denying he's talented. I think that Angelina and Wesley will continue to struggle. I think they're good chefs, but they seem a little shell-shocked at finding themselves in this situation. I think Grayson will be up and down, up and down -- if there's one quality I don't see in her, it's consistency. I think Kwame and Jeremy as a team would probably be unbeatable on this show. So far, other than Phillip, I'm finding most of the competitors to be pretty good eggs (no pun intended). For the second part of the season opener, the sixteen chefs went straight to another elimination challenge. This time, they were divided into four teams of four, each charged with opening a pop-up restaurant somewhere in Los Angeles. Padma, along with guest judge Ludo Lefebvre, divided the chefs into teams based on who they were standing next to, then handed each team a key with an address. That address would determine what kind of cuisine they would have to cook, since each was located in a different part of the city with a distinct identity. The grey team, consisting of Isaac, Marjorie, Angelina, and Amar, drove to a restaurant called "Taste of Tehran", where owner Saghar Fanisalek advised them on Persian food flavors. Isaac was a bit nervous, being unfamiliar with the cuisine, and Angelina was thrown for a loop when the store at which they shopped had no fish, but they both adapted well. Amar served grilled heirloom carrots with cauliflower hummus and vadouvan, which Wikipedia tells me is a ready-to-use curry spice blend. The judges seemed to love it, although Chef Fanisalek found the cumin a bit odd. Angelina prepared a fennel coriander crusted chicken with lemon confit and a fennel radish salad, which Tom said was nicely cooked although it could have used a little more salt and/or saffron. Isaac served a duo of meat: a lamb kofta and a spicy beef kabob with smoked eggplant, the last of which was Padma's favorite part of the dish. They noted that the dish was spicier than traditional Persian cuisine, but liked it nonetheless. Finally, Marjorie took a chance with a dessert, often thought to be the kiss of death on this show, and served a yogurt mousse with pistachio spongecake and saffron orange syrup. Tom called it very well-balanced and Chef Fanisalek said it incorporated lots of Persian flavors. Overall, Gail thought this team did very well, and Ludo remarked that they looked happier than he ever had when doing a pop-up restaurant. As the orange team, consisting of Phillip, Grayson, Renee, and Francis, drove to their address in Venice, Phillip noted that it has no ethnicity, because it's a neighborhood of white people. So it perhaps wasn't surprising that their cuisine turned out to be vegan, at a restaurant called "Seed Kitchen" which is owned by Eric Lechasseur. Phillip and Renee seemed happy with this, as both their restaurants are vegan friendly and produce-centric. Grayson, alas, began whining immediately, saying that God put animals on this Earth for one reason, to be eaten. When service started, Phillip served a dish he called "Cauliflower, Cauliflower, Cauliflower", which was four different colors of that vegetable roasted and served with red onion in lime juice. Tom liked the cauliflower itself but didn't care for the puree, which Gail agreed had a surprising lack of cauliflower taste. Chef Lechasseur also thought it needed more punch. Francis served chana masala, which was a chickpea curry with saffron and tofu chips. Padma said it was delicious and Gail particularly liked the tofu chips, but Tom (as I knew he would) had a big problem with Francis using canned beans instead of fresh produce. I think from the number of times Francis emphasized, both in the grocery store and at Judges' Table, that the can said "organic," I wonder if she's confusing the word "organic" with "fresh" -- but surely she knows that canned beans are not fresh no matter what the can says! Renee made a stuffed beet with toasted cashews and a bitter spring green sauce. Ludo called it both dry and mushy, and Tom said that whatever was at the center of the tofu and nuts was both heavy and pasty. This was disappointing to me, as I've only recently discovered how good beets can taste. Grayson served a charred bean salad with pickled red onions. She was the only chef that Padma asked (at least on camera) how she felt at service, suggesting to me that they were fishing to see if Grayson would whine. At any rate, the judges concluded that this bean salad was the vegetable version of Grayson's uninspired meatball dish of the previous challenge, something that anyone could make at home. 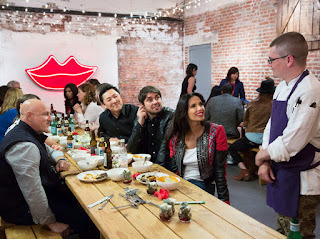 Karen, Carl, Jason, and Giselle made up the purple team, which got sent to Korea town, where they were met by the owner of "Lukshon", Sang Yoon, who has been a competitor on Top Chef Masters. Karen made a grilled kalbi with nectarine kimchi, which Sang Yoon said was the most Korean of the dishes they tried. Carl made a cuttlefish and shrimp salad with avocado; while Gail liked the texture of the cuttlefish, Tom and Sang Yoon said they wished that Carl had marinated or grilled it. Jason served chilled noodles with iced broth, cucumber, Asian pear, and egg. This dish went over well, with the judges commenting on the pleasant noodle texture and the sweet note added by the pear. Giselle made spicy fried wings with cucumber salad. Karen had expressed reservations due to Giselle's lack of confidence because she'd never made chicken like this before, but Tom and Ludo both liked the wings, even if Tom was not sure they were entirely authentic. Last but not least, Chad, Wesley, Kwame, Jeremy made up the blue team, which had to cook Mexican food. Chad had the advantage of owning two Mexican restaurants (one actually in Mexico!) and Jeremy also has a lot of experience in that cuisine. None of the chefs asked Ray Garcia, the owner of the restaurant "Broken Spanish" where they cooked, for any advice, which the judges later commented upon. Chad served carrots asado (which I think means a barbecue dish) with banana yogurt and carne seca (a kind of dried beef). Tom found the flavor good but the carrot undercooked, and Chef Garcia says he wouldn't recognize it as Mexican food with his eyes closed. Wesley served an orange and tomato stew with chorizo and hominy, another dish the judges found to be "not really Mexican" (and I thought I caught an unflattering reference to "Hamburger Helper" by the judges). Kwame made a chipotle raisin-braised shrimp with masa porridge and avocado lime puree. Tom said he did a nice job on the shrimp and masa in particular, and Chef Garcia liked the flavors. Jeremy served a grilled skirt steak and potato confit with a poblano and almond puree. While Tom thought the beef was well-cooked and well-seasoned, yet again they did not get "Mexican" from this dish, and Gail thought the sauce was not at all bold. The judges called all four teams before them, and quickly announced that the Persian team had won. Tom noted that they clearly enjoyed working together, they looked happy, and that it seemed they made good use of their "ambassador" for advice. After the judges paid compliments for all four chefs, Ludo announced that Chef Saghar wanted the winning dish to go on her menu: Majorie's yogurt mousse and spongecake dessert. I was really pleased at this outcome, because Marjorie took a chance instead of playing it safe, and she seems fairly down to earth so far. That can be pretty rare on this show sometimes. Then came the bad news. Padma announced that the vegan team was the least favorite, although Gail was quick to point out that Kwame's dish was mainly responsible for keeping the Mexican team off the bottom (surprising considering he said it was his first time cooking Mexican food). Tom dinged Francis on the use of canned ingredients, and Grayson on the lack of inspiration behind her dish. Padma and Gail told Renee they liked the use of her spring greens, but the beet itself was underwhelming. Phillip's dish, they found, was just not a stand-out; Gail called it fussy and (I think) "tweezified," by which I think she meant that it was too much about fancy presentation and not enough about bold flavors. In the end, I was disappointed that Renee went home. I can't fault the judges for the decision, not having tasted the dish, but based on lack of inspiration and innovation, I would have preferred to see either Francis or Grayson go home before Renee. I have to admit I'm biased against Grayson by this point; I was a little disgusted to see her complain in the Stew Room to Renee that Renee told the judges she didn't want to make "just a salad." Grayson seemed to think that was Renee's attempt to cast aspersion on Grayson, whereas I think that in the two seconds Renee had to respond to the judges' comments, perhaps Grayson was not the first thing on her mind. This is a tough call. I like both cauliflower and beets, so would love to see how someone with a lot more talent and experience than I have might make them, but clearly the judges didn't think too highly of those dishes. Marjorie's dessert would be the obvious choice, but I'm just not a dessert girl. So for me, it would have to be Angelina's fennel and coriander crusted chicken. That coating looked mouth-watering. 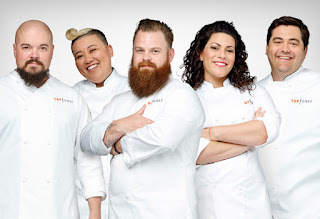 Overall, this was a very solid episode, by which I mean that the teams were chosen fairly, the challenge was tough but not impossible, and the chefs cooked up some interesting dishes. Right now, I feel like Kwame is one of the chefs to watch. Phillip reminds me a little too much of Marcel from prior seasons. I'll be surprised if Grayson survives much longer. As for the rest of the chefs, I don't feel like I've had enough chance to form a strong impression yet. One small complaint: I was mildly annoyed by the extremely pointed tweeting that Padma and Gail did while driving to the pop-ups. Since this was filmed weeks or months ago, what's the point of displaying those old tweets now, except to show how hip and trendy Top Chef is? I get really tired of social media sometimes... (she says while blogging). Houston Ballet principal dancers Karina Gonzalez and Connor Walsh. 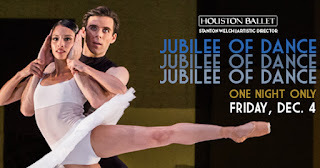 Most people, when they think "ballet" and "holidays," think of The Nutcracker, but for me, the Christmas season begins with Houston Ballet's Jubilee of Dance, a yearly one-night production that takes place on the first Friday in December. For one evening, the dancers and audience get a break from Sugar Plum Fairies, and instead perform highlights from past seasons as well as the upcoming season. Many years, there is a short video retrospective honoring a retiring dancer or a long-term employee. And although the company's principal dancers do appear throughout, I tend to think of this performance as something of an "audition" for some of the non-principal dancers, as they are often featured in significant and/or difficult roles. 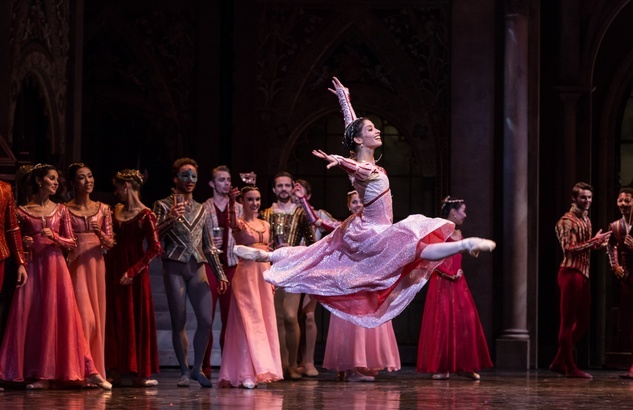 The performance opened with Sleeping Beauty's "Rose Adagio", which Wikipedia describes as "one of the most notoriously difficult sequences in all of ballet." This piece featured Katharine Precourt, who along with Karina Gonzalez is one of my two favorite female dancers in the company. I can see why the piece is considered so difficult; the princess, Aurora, accepts a rose from each of her four suitors, and balances in one precarious position for an impossible length of time, while each suitor comes forward in turn to take her hand. I thought Ms. Precourt danced it beautifully. I have to admit that I wasn't crazy about the costumes, though; Aurora's tutu was a garish pink that looked even more out of place due to the lack of stage sets. Throughout the first "act," we saw two other pieces from The Sleeping Beauty: the Act III pas de deux, featuring Sara Webb and Jared Matthews, and the Act III finale. In February/March 2016, the company will be performing the full production to honor the 80th birthday of Artistic Director Emeritus Ben Stevenson. The second "act" consisted of a single piece: the Capulet Ball and the balcony scene from last season's new production of Romeo and Juliet (preview post here). This time they did use the full sets, and it was as scrumptious as I remembered, with principals Connor Walsh and Karina Gonzalez reprising the lead roles. My favorite part of the evening was the third act, Brigade, choreographed by Stanton Welch and set to music by Benjamin Britten. I'm not particularly a fan of Britten's operas, but I do like his ballet music. This piece had several movements, each featuring a different dancer or small group in classic, pale blue costumes dancing with classic technique. There was also a big finale featuring many artists. The only set dressing consisted of several crystal chandeliers, but it was enough to give the impression of a grand ballroom. I felt that this act had more energy than the others, and for me the standout performance was that of Hayden Stark during the "Waltz" movement. In addition to The Nutcracker, Houston Ballet has four other major productions coming in the first half of 2016: the aforementioned Sleeping Beauty and Giselle, and two mixed rep performances, one of which will include pieces from West Side Story. If you live in Houston and you haven't seen what this company can do, I highly recommend going to at least one of these shows. Personally, I prefer the variety and energy of the mixed-rep programs, but you really can't go wrong with any of their performances. And Top Chef is back! This season takes place in California, and if Tom Colicchio is to be believed, this is one of the strongest groups they've brought in. One of the first things Padma did was ask those contestants who are executive chefs to raise their hands, and that was most of them. There's one returning competitor: Grayson, who was eliminated from the season that took place in Texas about four years ago. Personally, I tend to enjoy seeing younger, less experienced chefs, but on the other hand, watching a chef who has mastered what it is they do is enjoyable in itself. After introducing just a handful of the chefs -- I do like the way they intersperse the little get-to-know-you clips throughout the episode instead of lumping them all up front -- the episode dove right in to the Quickfire, the now-traditional mise en place relay. This time, the seventeen chefs were permitted to choose the ingredient they thought they could do most quickly, from among eggs, artichokes, asparagus, oranges, and chicken. That is, they were allowed to choose to a point, because as Tom put it, the ingredients were "first come, first served." Sigh.... Will they never get tired of making people fall all over each other to get to the ingredients? Anyway, the first nine chefs to finish their prep work to Tom's satisfaction moved on to the second round, during which they were divided into three teams and told to prepare a dish featuring at least one of their relay ingredients. The twist was that they had to cook in another relay, except that the second and third legs of each team would be blindfolded so they would be starting their "shifts" without knowing what they were being handed. We've seen this before and I think it's an interesting test of a chef's ability to jump right in and cook on the spot. Renee from Kansas went first for the blue team, pulling from the pantry such ingredients as mint, cabbage, and ponzu (a Japanese sauce made from soy sauce, lime juice, vinegar, and fish flakes). She was followed by Frances, and while I'm not quite sure what Frances did because she didn't get much camera time, she was chopping cabbage as though her life depended on it. Amar went third, and decided to go sweet and sour with the chicken and Asian slaw that he found. Padma loved the mint and said the dish had really nice flavors. Isaac went first for the green team and decided to go Cajun. I wondered about this because it's a specific cuisine that his teammates might not have known anything about, but on the other hand, a team playing it safe isn't likely to win. Grayson followed him and decided to go Italian, which suggested to me that Isaac hadn't set things up in an obvious way. Carl, going third, seemed to have a good handle on things and finished a dish he called breaded chicken breast with brown butter, asparagus, and mushroom sauce -- although I don't think that's particularly Cajun or Italian. But Tom did call it nice and moist. Jason, who cooked first for the red team, admitted that he had no plan; he boiled eggs, and put on a blanching pot and some chicken on the grill. Jeremy, who came next, had no idea what to do with what little Jason had left for him; he started cooking carrots in cream and put more chicken in the oven. Poor Wes, who went last, didn't know about the chicken in the oven, so he went to the grill, where the chicken was both blackened and still raw. He salvaged a bit of it, and the resulting dish was grilled chicken with carrot-orange puree, capers, and anchovies. Padma called it an appetizer-sized portion, and Tom commented that the dish contained a lot of anchovy. In the end, Tom's least favorite dish was the red team's; he said it tasted like it was cooked by three different people, and that the anchovies overpowered everything else. Between the green and blue teams, Tom thought that the green team's chicken was beautifully cooked and perfectly seasoned. For the blue team, he thought some of the knife work was clunky but the flavors were good. Ultimately, the blue team won with the flavor, giving immunity to Renee, Frances, and Amar. Considering that Renee was also the fastest out of seventeen chefs in the mise en place Quickfire, she's probably going to be one to watch. As the chefs went shopping, I started thinking about how much fun the first episode of the season is. I have to imagine that the editing that goes into this show is pretty skilled, because it's also fairly transparent much of the time. Yet over the course of the episode, we gradually get to see the personalities and styles of the chefs that we'll come to know over the next several weeks. Speaking of editing, some of the footage showed that Wesley apparently comes by his nickname "Cochino", or "Pig", quite honestly. I was pretty horrified to see him chopping and pureeing a tomato with the produce label still attached, and his workstation was a disaster area. To be fair, several chefs, including Wesley, commented that cooking in a strange kitchen is really hard, and I certainly can sympathize with that. The service the next day took place outside on a cloudy day with the famous Hollywood sign in the background (trust me, the judges were artfully arrayed underneath it). I loved that each chef's booth had a wooden sign with their name and a silhouette of their home state on it; it would be nice if they get to keep those as a souvenir. During set-up, I was surprised to hear a contestant named Garret Fleming say that former Top Chef All-Stars alum Mike Isabella serves "one of the worst bastardizations of kind of Italian food in the history of the world." Really? This from the chef who claims to be mixing Southeast Asian and Italian influences? I have to say that although I can see why some people might prefer Mike Isabella in small doses, I felt he was pretty authentic when it came to his food. But honestly, at this point in the show, a lot of the chefs are looking for any excuse for bravado, to be able to say something that might stand out on camera. On the other hand, I will say about Garret that I'm impressed with anyone who can make fresh pasta for 200 people in a few hours. 1) Gail Simmons is extremely articulate in expressing exactly what she does and doesn't like about food. I really like that about her. 2) There are some dishes that just look so good but that I sadly would not eat, such as Grayson's pork and veal meatballs. I'd like to be a vegetarian but don't quite have the discipline. When I do eat red meat, though, it's definitely not going to be pork or veal. Anyway, speaking of Grayson, I'm not sure she's emotionally any more ready for this season than she was for the last time she competed. 3) Oh dear, Wesley. Did you seriously just put that spoon in your mouth and back into the food? 4) The dishes are so varied that I'm blown away. 5) All I want, as I'm watching, is to see people succeed. I love when Tom or Padma or Gail or Emeril tosses one of the chefs a compliment, and the chef just glows with it. Back to the competition, I found it interesting that the "critics" were weighted heavily enough that they chose for the judges the top and bottom five chefs, and the judges subsequently couldn't consider anyone in between. But I do think it's probably wise to strike a balance between the judges' expert (and possibly jaded) opinions and those of the non-experts, if food bloggers and critics can be called non-experts. Amar (meatballs), Jeremy (fish crudo), and Carl (carrot soup) had the judges' favorite dishes from the critics' top choices. The winner in the end was Jeremy, and hoo boy, it's gotta be a great feeling to win the first challenge. On the bottom end, we had Angelina (goat cheese croquette), Garret (chicken brodo (whatever that is)), and Grayson (also meatballs). I'd thought it was obvious from the commentary that Garret probably wouldn't be going home, because Emeril thought his dish was just fine. Grayson embarrassed herself by reacting defensively to everything the judges said, and (in my opinion) should have been chosen to go home before Garret. I have to wonder if she wasn't kept for the drama potential. But in the end, it was Garret who left, and as always, I'm a bit sad for the chef who didn't get to show us a little more of what they can do. Tomorrow night ... Part 2!